When you love a sport, you can push yourself too hard. Injuries happen to all active people and the repetitive motions involved in tennis and golf can take a toll on the elbow. Let’s talk about this common condition for tennis and golf enthusiasts and find out more about tennis elbow vs. golfer’s elbow: the causes, symptoms and treatments. While both tennis elbow and golfer’s elbow affect the tendons which join your forearm to your elbow, they affect different tendons. Tennis elbow impacts the tendons on the outside of the elbow. These are responsible for the ability to bend your wrist back and straighten your fingers. Known as lateral epicondylitis, you don’t have to play tennis to be affected by it. Repetitive movements in daily life and work are enough to do that. The same is true of golfer’s elbow, which is known as medial epicondylitis. These tendons make flexing the wrist and grasping objects (like a golf club) with the fingers possible. Anyone engaged in repetitive actions involving these tendons is vulnerable. The cause of both these conditions is tendinitis, arising from repeated and sustained use of the tendons implicated. In the case of these conditions of the elbow’s tendons, symptoms will manifest similarly. Because of the location of the tendons involved in each, though, they’ll manifest on either the outside or inside of the elbow/forearm. Pain from tennis elbow radiates down the outside of the elbow to the hand and is accompanied by weakness and tenderness. Pain can be especially acute when attempting to grasp an object, or execute a backhand stroke. 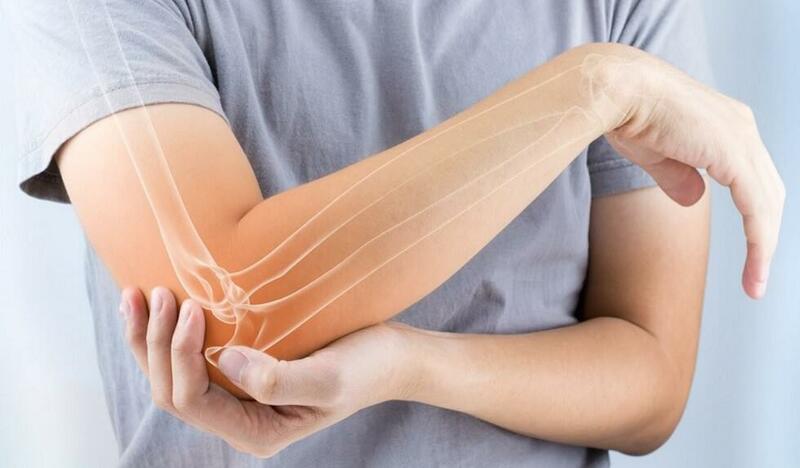 Golfer’s elbow has similar symptoms, as stated earlier, but on the inside of the elbow and forearm. Weakness and numbness are also present, as well as difficulty flexing the affected wrist. It should be noted that both conditions are progressive, in that symptoms worsen over time, so getting to a medical professional who can help is key. These conditions can become debilitating if left untreated. Tennis and golfer’s elbow are both treatable with conservative therapies. Depending on how far the condition has progressed, either can usually be resolved in from several weeks, to several months. Wrist splints, athletic tape and bracing may all be employed to allow the tendons time to heal. Of course, rest is the best friend of tendon strain. Further treatment to re-train the muscles and tendons involved may be pursued with a physical therapist, to avoid recurrence. Minimally invasive therapies like Platelet Rich Plasma (PRP) or cortisone injections may also be deployed to hasten recovery, especially in the case of professional athletes. At North Jersey Orthopedics and Sports Medicine Institute, we treat all kinds of people with musculoskeletal conditions. You don’t need to be an athlete to take advantage of our advanced treatments and therapies, either. If you’ve got the elbow, maybe it’s time to come in and talk to someone on our team of skilled clinicians. We’re the team that partners with you for your total recovery.